S1 Special Edition Release For All Regions!?! More interesting news about the Season One Special Edition DVD. According to this entry on Amazon.co.uk the boxset will be released on 20th of May, for all regions! Now obviously this could be a miss print, and Amazon is currently the only non-US online shop listing it that I know of, but it seems doubtful they would put up a Amazon UK listing for it up without some sort of release date. This is currently no price given on the Amazon UK page. There’s a wealth of Fox PR on the boxset at the link below. Whose Your Vote For President? The new poll asks how excited about the S1 Special Edition DVD you are. 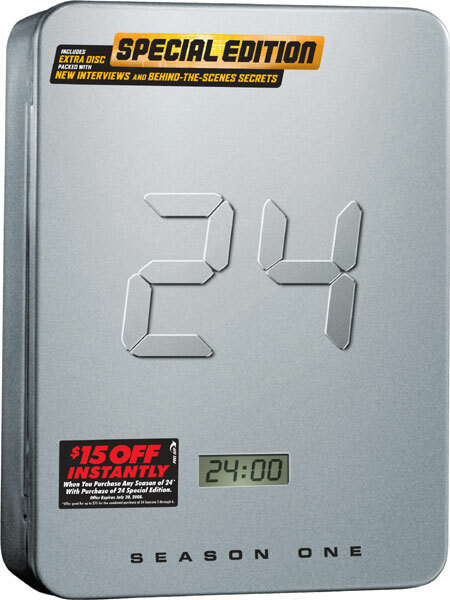 As if to make up for no new 24 until next year, Fox have this morning officially announced the “24 Season 1 (Special Edition)” DVD. Many will remember the original Season 1 DVD release was pretty much devoid of extras. Full details below the image of the rather cool metal cover. At the moment the only release date known is for the region one edition on May 20th. But i’m fairly certain a region two release can’t be that far behind. For me the most interesting extras will be the commentaries on both the pilot and the series finale, it will be incredibly interesting to hear Stephen Hopkins, one of the key architects of the show’s unique style talk about these two key episodes. As well as to hear Leslie Hope talk about the series finale. The boxset will retail for around $60 in the U.S.
A new wave of stories have been appeared regarding the January ’09 start for Day 7, this time citing Fox directly as the source. You can now mark the month in your calendar. Update: Some good suggestions as to reasons why in the comments by “Serial Rocker”. I thought I would put them in the main post for everyone to see. Regarding why 24 can’t simply be run later than normal, there are several factors. The first is the fear that a show running into the summer will lose viewers as the networks seem to hold to the opinion, rightly or wrongly, that people watch less television during the summer months. That is one of the main reasons why a television “season” covers the months that it does. This is the basic reason why Fox wouldn’t want to simply start airing Day 7 as soon as it could air all 24 episodes in one run. Because atleast the tail end would run into the summer season. Also, there is the fact that many of the cast and crew are only contracted to a show for certain times of the year. I’ve no idea if this is the case for 24 but it is quite possible that Kiefer and the other actors may be contracted to other projects after a certain point, making them unavailable for involvement in the show should it run later than planned. Another good point, although I believe given the nature of the strike, every production schedule is being moved around right now, and so for the key actors ’24’ would have been there priority. But I can certaintly see it as a serious problem for recurring guest stars, who may have been unsure exactly how many episodes they would be wanted for anyway. I think either way we may notice a few characters and actors written out after episode 8. Finally, and this is a purely speculative point that occured to me and may or may not be the case, given the nature of 24’s format, should the “night” hours of the show run through the middle or late into the season (which appears to be the case from the litle I have seen of the early episodes) then filming the outside locations during the months of the year when it is dark for only a short time of the night would probably require a hell of a lot of late nights and difficult shoots. Not something they would want to have to worry about given all the other issues of getting back into production. This I think is the best point, it’s somewhat of an open fact about 24’s production schedule that it’s easier to shoot the nightime episodes during the winter and the daytime episodes during the summer. An increased production time eases these concerns. January ’09 For Day 7!? Various sources (TV Guide, Variety, IGN) are reporting that 24 returning with Day 7 in January 2009 is an almost certainty. Needless to say you probably shouldn’t be marking it in our calendar just yet, wait for official confirmation from Fox before you do that. Personally I don’t honestly see Fox allowing a gap of some 19 months between seasons, it would surely be ratings poison. I still hold out hope of it premiering this fall. I’ll post more when I have it. Once again, sound off in the comments with your opinions.